A retrospective of Bernhard Willhelm and his business and creative partner Jutta Kraus just opened at the Groninger Museum. Curated by Sue-an van der Zijpp and Mark Wilson, known for having curated the first retrospective of Hussein Chalayan, the exhibition is an exhausting chronicle of the idiosyncratic fashion that Willhelm and Kraus produced over the last 10 years. 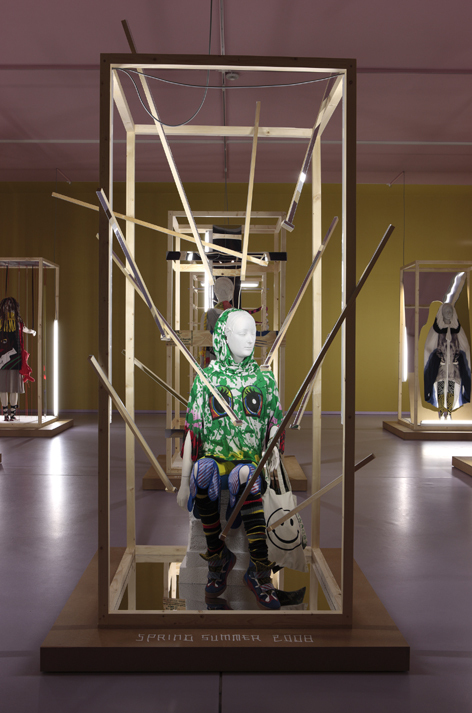 The exhibition design, which Willhelm and Kraus developed in collaboration with the Groninger Museum, started with the use of mannequins based on classical statuary—an interesting choice for the decidedly non-classical silhouette embodied in their designs. The exhibition is accompanied by a catalogue, published by NAi Publishers. It is abundantly illustrated with photos of every collections that Willhelm and Kraus have thus far produced. The catalogue also includes an essay by the German-based journalist Ingeborg Harms on their backgrounds, an interview with the designers by Sue-an Van der Zijpp, as well as an essay I wrote on their work’s relation to the grotesque and carnival themes. The book is available through NAi Publishers, while the exhibition remains open through April 11, 2010.